On his trip to Cuba - February 20 to 27, 2008 - Card. 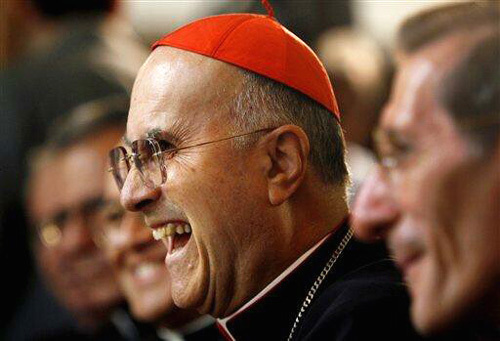 Tarcisio Bertone, Vatican Secretary of State, strongly attacked the American economic embargo against Cuba. Bertone qualified this anti-communist position of the United States as "unjust and ethically unacceptable." In a press conference he stressed that the restrictive measures imposed by Washington "constitued an oppression of the Cuban people and a violation of their independence," reported Granma, the official organ of the Cuban Communist Party. 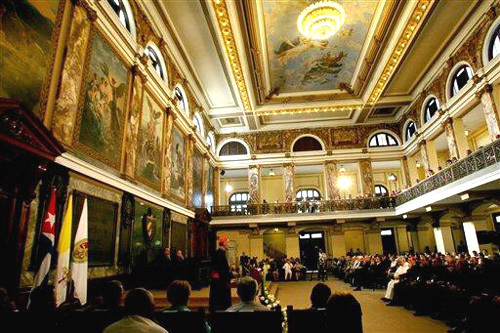 The Cardinal also affirmed that the Vatican is pressuring the American government to suspend the embargo. The principal objective of the trip was to commemorate the 10th anniversary of John Paul II's visit to Cuba. However, Bertone arranged his schedule so that he would be the first foreign representative to be received by Raul Castro, who took office as President officially on February 24. Since July 2006 Raul had been acting in the place of his brother Fidel, who finally announced his resignation for health reasons in mid-February. 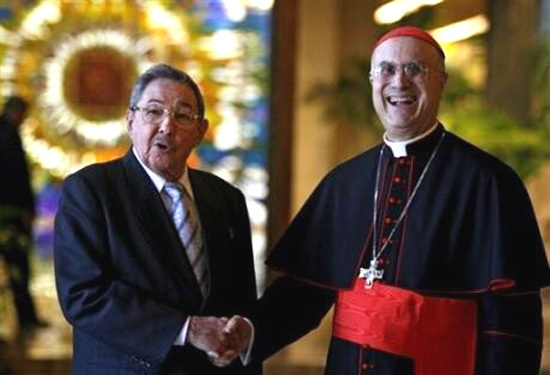 After saluting the change of government and Raul Castro's inauguration, the Cardinal admitted that "the fundamental line remains that of the supreme leader (Fidel)," La Croix reported. The representative of Benedict XVI sent "respectful" greetings to Fidel Castro and wishes for his recovery, and described diplomatic relations between the Vatican and Cuba for the last 10 years as "excellent." During his visit to Santa Clara city, Bertone received messages from the people asking him to intercede for the liberation of 240 political prisoners. The news reports did not mention whether or not he complied. Above, a beaming Bertone is received by Raul Castro at the Communist Revolutionary Palace on February 26, 2008; below, first row, a close-up of his press conference, during which he attacks the United States. Second row, he delivers a speech at the University of La Habana, after having paid his respects to Communist heroes José Marti and Felix Varela, whose remains are housed there.